Purpose: The study makes an attempt to understand the drivers of mobile banking adoption within the framework of the unified theory of acceptance and use of technology (UTAUT) model. Design/methodology/approach: Considering the business implication of mobile banking in Jordan, the authors were inspired to explore the theoretical concept with a randomly selected group of people. The data collected through questionnaire was analyzed using IBM SPSS and AMOS. In this study structural equation modeling technique was applied to understand how the UTAUT model factors can predict the behavioral intention to adopt mobile banking. Findings: Analysis illustrated that performance expectancy; effort expectancy and risk perception significantly influence user's intention to adopt mobile banking services. However, no significant relations could be established for social influence and trust. Authors acknowledged that the adoption of technology is also influenced by several factors external to the scope of this research. Practical implications: The banking organizations in Jordan are eager to leverage their mobile banking services. However, in spite of their endeavors, significant advancement is yet to be made. As per the findings of the study, m-banking organizations should focus on improving the performance and safety and ease of use of the mobile banking system. Originality/value: This study focused on detailed review of Jordan based literature on mobile banking adoption. Things are rapidly changing as technology is evolving. This study tends to capture the very recent picture of m-banking adoptability. Mobile Banking; UTAUT; Wireless Commerce; Technology Adoption; M-Banking; Unified Theory of Acceptance and Use of Technology; Jordan; AMOS; SEM. With massive developments in the technology sector, new opportunities are opening up with promises of smarter and faster services to make everyday life easier. Nowadays, everybody has a mobile phone and users are interested in shopping and paying on the go. Growth in the 3G smartphone market, wireless communication and e-marketing create an opportunities to use the platform for a variety of purposes. Banking has also seen a lot of improvements over the year. People are more comfortable and encouraged to spend money. Every day we are making transactions, whether as an investment or purchase of commodity/services. Therefore, the possibilities of utilizing this gift i.e. technological boom to ease the banking cannot be denied. Barnes  defined mobile banking as a media where customer conducts banking and communicates with banks using a portable device. Researchers show that, even though attempts have been made to utilize the power of wireless technology for mobile banking, we did not achieve the expected advancement . Luarn and Lin , Laukkanen  and Yang  believe that mobile banking comprises a very small portion of the whole banking transactions. Kleijnen et al. also agreed with this and think that mobile banking is still lagging behind and yet to meet the expectation. Therefore, this creates a need to investigate the acceptance technology in banking on the go. Researchers in different part of the world conducted investigations to understand the adoption of m-banking using popular theories like Technology Acceptance Model (TAM), integrated model of Task-Technology-Fit and Unified Theory of Acceptance and Use of Technology (UTAUT), and Innovation Diffusion Theory (IDT) [7-9]. In this study authors were inspired to explore the scenario for Jordan. Between online banking and mobile banking, it is evident that mobile banking offers more mobility . Authors investigated and tried to understand how UTAUT factors influence user's intention to use mobile banking services. 1. Can UTAUT model predict consumer's intention to use Mobile Banking services in Jordan? 2. What are the factors influencing intention to use Mobile Banking services in Jordan? In this research author focused on the work of Venkatesh et al., [3,11-13], and Sripalawat et al. to develop the research model. Performance expectancy is termed as the perceived gain from using the M-banking services and effort expectancy represents the amount of effort required to receive the desired performance. Social influence is termed as the influence by the peer group and surroundings to avail the service. Perception regarding the risk of using the service and trust on the availability and reliability of the service constitutes the rest two factors in this model (Figure 1). From the study of literature and previous works in the similar field, the authors developed the following hypotheses to investigate the influence of corporate governance on the effectiveness of accounting information system in an organization. H1: Performance expectancy predicts consumer's purchase intention i.e. intention to use Mobile Banking services. H2: Effort expectancy predicts consumer's purchase intention i.e. intention to use Mobile Banking services. H3: Social influence predicts consumer's purchase intention i.e. intention to use Mobile Banking services. H4: Risk perception predicts consumer's purchase intention i.e. intention to use Mobile Banking services. H5: Trust factor predicts consumer's purchase intention i.e. intention to use Mobile Banking services. H6: UTAUT model is fit to explain consumer's purchase intention i.e. intention to use Mobile Banking services. To understand the implication of the theoretical framework in mobile banking the authors reviewed the literature depicting the mobile banking scenario in Jordan and use of UTAUT model to investigate the underlying factors influencing mobile banking in different regions. Apart from the study of theory, past researchers present evidence of an association between UTAUT factors and user's behaviour to avail mobile banking services. Technological advancement in Jordan encouraged many banking organizations to introduce mobile banking as a service. It not only made banking easy for the mass but also expanded geographical coverage within the region [15,16]. Jordan has four big service providers supporting nine million subscriptions (The Jordan Times). Jordan has 15 out of 26 banks providing mobile banking services which comprise 58% coverage in terms of service availability. In spite of all that effort, the service adoption is not up to the mark till date. Alafeef et al. found in his study that, only 6 out of 100 customers are availing mobile banking services. His work illustrated that 31% of these customers are not aware that this service is made available by their banks. Lake of media coverage and social influence can be attributed to this situation. Although Jordan is lagging behind in terms of usage of this service, there have not been many attempts to demystify the puzzle. Factors such as perceived skill/effort requirement, safety concern and trust on the system can also be blamed for this scenario. Alalwan, et al. in their study demonstrated that balance enquiries/ bank statements are the most widely used service of mobile banking in Jordan. They found bill payment to be the second most widely used service of mobile banking. Fund transfer was found to be the third popular use of the service. The rest use the service for paying installments of loans and mortgages. They found that 65% have never applied for these services via Mobile banking. The study focused on UTAUT framework proposed by Venkatesh et al. . UTAUT and its extended theoretical frameworks are very popular and widely used to predict behavioural intention for the adoption of technology. Venkatesh along with many other researchers illustrated that customer's purchase/usage intention are likely to be predicted by performance expectancy (PE), effort expectancy (EE), social influence (SI), and facilitating conditions (FC). Several modifications/adoption to the concept mentioned several other factors also. In this study authors decided to include risk perception and trust factor and were encouraged to reestablish the model in Jordan's context. Initial UTAUT derived from its predecessor models i.e. Technology Acceptance Model (TAM), Theory of Planned Behavior (TPB), Theory of Reasoned Action (TRA) and the Innovation Diffusion Theory (IDT). User's expectation on the performance of technology influences his intention to adopt the technology. Past research shows the evidence of influence by perceived performance on behavioural intention to adopt mobile banking . Venkatesh et al. in their work provided evidence that customer's intention to adopt technology depends on how they perceive the usefulness of the technology. Mobile banking promises to be a fast and portable media of financial transaction and therefore, user's perception of the delivery of those promises determine the success of this Endeavour. Researchers in different geographical locations considering various domains found that performance expectation is a vital factor to help users shape their behavioural intentions [3,14,20-22]. Experts in technology adoption models emphasised that user's perception of ease of use determines the acceptance of the technology. Easy to use and requirement of less effort is one of the key reasons the users of Mobile Banking services adopt the technology. The service is expected to make their life easy by providing a userfriendly interface and quick set payment setups. The concept has been explored in the past by many researchers [3,14,18,23]. Venkatesh et al. acknowledged the importance of social influence in the adoption of technology in his work. Researchers used various predecessor frameworks such as TRA, TAM2, TPB/DTPB, etc. To understand how social influence shape the purchase intentions in customers. In his work Singh demonstrated that decision to adopt mobile commerce services had influence from near and dear ones. Being a part of his surrounding human cannot ignore the social influence in his day to day life. The desire to blend in or connect encourages people to adopt and innovation adoption studies support this fact . Perception of risk associated with adopting mobile banking influence people's behaviour to use the service. By nature, people are resistant to change come out of their comfort zone. Therefore, fear of additional security issues or loss of privacy refrain them to explore opportunities. Lack of proper understanding of how the system works and self-perception of privacy hinders adoption of innovation . Previous experience with technology and perception on confidentiality and security, influence technology adoption . Trust plays a vital role in the acceptance of the technology. The reliability and availability of the system when the user needs the service is an important factor affecting adoption of such services. In their work Kim and Prabhakar  illustrated that the trust plays a significant role towards new technologies adoption. The system should be up and active on time and when need. Real time customer support when the inconvenient situation arrives builds up trust. The system should be robust enough to provide 24/7 service availability. Brown et al. , in their work, found that relative advantage, trialability, the number of banking services, and risk significantly influence mobile banking adoption. They applied theoretical frameworks such as IDT and DTPB. The study was based on South Africa and included 162 samples. Application of extended TAM by Luarn and Lin  showed that Perceived self-efficacy, financial costs, credibility, easy-of-use, and usefulness influence intention to adopt mobile banking. 180 respondents from Taiwan participated in this study. Amin et al. applied basic TAM with 156 respondents from Malaysia and concluded that perceived usefulness, easy-of-use, credibility, the amount of information, and normative pressure significantly influence the intention to use mobile banking. Laforet and Li  applied theories on Attitude. Motivation, and behaviour and predicted that awareness, confidential and security, past experience with computer and new technology influence mobile banking adoption. The study included 300 respondents from China. Laukkanen  conducted 20 interviews large Scandinavian bank customers in Finland and found that Perceived benefits i.e., location free and efficiency influence people to use mobile banking services. Suoranta and Mattila  applied Bass diffusion model and IDT framework and concluded that Information sources, age, and household income play vital role in the adoption of mobile banking. They included 1253 people in their study. The following part contains the detail of methodologies adopted to complete this research. There are multiple sections which include the research approach, data collection, and sampling and analysis methods. In addition to this, it explains the ethical considerations while collecting the data for this research. Study approach is vital and explained properly to understand how the overall research has been conducted and why on the selected topic. The research approach linked with the research questions in such a way that effective conclusion can be drawn. There are 2 different types of research approaches adopted on the basis of relevance by the researchers. These 2 approaches are Deductive and Inductive . Inductive Research Method is defined as an approach to the research which starts with the discussion of more focused areas and then moving on the general discussion whereas deductive approach starts with the discussion of general things and then creating a link between these general things to make a specific discussion. It is not reasonable to decide which approach is more suitable on the basis of utility because every research has the different criteria. This research is based on the application of Deductive Approach because this study is conducted with the employment of some general discussion and then moves to the application of UTAUT model in financial domain keeping the research questions in focus. Deductive Approach is more useful here because discussion of some general areas is essential in this research as to grab the attention to the relevant area with strong backend discussion . There is a literature review based discussion on the unified theory of acceptance and use of technology and its use in mobile banking in different countries. Data Collection is an integral phase of research because the research itself means searching and getting familiarities with different sources to work on a selected area. There are 2 types of data sources named the Primary and Secondary source . Primary Source is based on the collection of data directly from the original source and it does not include any intermediary to receive data from. Primary Sources consists of Surveys and Interviews. Secondary Source, on the other hand, is based on the collection of data on secondary sources which are already present to be exploited. These sources are in form of Relevant Literatures, Case Studies, Journals, Articles, Web References and Books. The researchers conducted detailed Literature Review to formulate the conceptual design. However, due to the nature of the study authors applied primary data collection approach using questionnaire. Questionnaires were focused on the research questions. It contains 20 questions on 6 factors associated with UTAUT model. The questions were on a seven-point Likert scale format ranging from strongly disagree to strongly agree. The study population is based on Jordan. Authors distributed400 questionnaires and received 352 responses after two months. Out of these 352 responses, 12 were deleted as they were unengaged. Authors retained 340 responses for analysis. Sampling is the process of selecting a specific number of representatives from a population but the selection is done on the basis to make a small but identical representation of the population. The sampling has been done with proper consideration because the whole analysis and conclusion is based on this . It is essential that population and the sample of the population are relevant to the requirements of the research so that achieved results can be held reliable and authentic to conclude. This research is based on mobile banking and therefore it has been assured that sample and population are being relevant to this area. Researchers considered people who sometimes/often use mobile banking for their financial transactions. Among such population, a simple random probability technique has been adopted for the process of sampling for this research because it provides expansive reach to assess results with even low probability . The participants are a citizen of Jordan. During sampling, the authors did not consider gender or age differences and everybody had an equal chance of receiving the questionnaire. A consent letter was sent initially to each and every connection to seek their willingness to take part in the survey and only willing connections were then used for the sampling and so nothing has been enforced throughout the survey. Researchers considered the work of Venkatesh and Zhang , Luarn and Lin , Foon and Fah  and Sripalawat  and used questionnaire items similar to theirs'. Authors asked questions focused on understanding performance expectancy as the extent to which a person believes that adopting mobile banking will help him/her gain banking performance. Questions on effort expectancy focused on the amount of effort required to use the mobile banking service. Questions on social influence investigate how a person is influenced by society and his peers to use mobile banking services. Risk perception related questions illustrate a person's consideration on security and privacy threats. Furthermore, trust indicates user's opinion on system's availability and acceptance. The authors were inspired by past studies to use SPSS and AMOS software as the tool for statistical analysis. Although there were a few who used other software capable of running SEM such as PLS-SEM, the majority of the researchers lean towards AMOS. The data collected have been screened properly for unengaged responses and data entry errors. After that, the reliability and validity were checked to make sure the questions have consistency. To properly predict the UTAUT factors, the authors applied Confirmatory Factor Analysis (CFA) technique to develop latent factors. These latent factors than have been used for Path analysis via Structural Equation Modeling (SEM). Ethics is very important part of every research because it has several implied characteristics that are required to be complied by. This study has been on the lighter side in terms of ethical considerations. There have been less ethical issues which were expected in this research because the major ethical requirement was the attainment of consent acknowledgement by participants and protection of their personal information. This was a big ethical consideration in the conduct of this study and it has been performed duly. In addition to this, there has been the use of several kinds of literature, journal, articles and web sources to complete the study and according to academic guidelines, it should be referenced properly. This is another ethical consideration and it has also been performed well by using proper referencing method to cite each and every source used to complete this study. The data gathered through questionnaire have been entered and coded in SPSS accordingly so that proper statistical analysis can be conducted to answer the research questions and test the hypotheses in the previous section. Authors used SPSS AMOS for conducting CFA and develop SEM model. Before going into the model testing authors conducted reliability analysis to assess the internal consistency of the items for each latent factors of UTAUT model. Following table shows the Cronbach's Alpha scores achieved for each factors. Researchers suggested 0.7 as an acceptable minimum threshold for Cronbach's Alpha . Analysis illustrates that, all the constructs satisfactorily met the requirement for reliability with α >0.7 (Table 1). A confirmatory factor analysis has been conducted to illustrate how the 15 questionnaire items explain the 5 UTAUT factors. 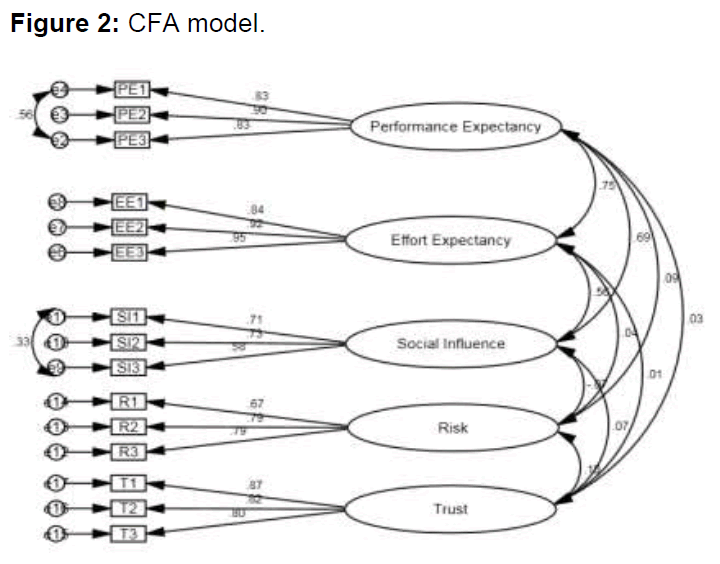 The CFA model seeks to explain the how well these latent factors are defined by the questionnaire items developed to understand participants opinion regarding the UTAUT factors. The initial model has been improved by applying logical modification suggested by AMOS. Figure 2 shows that covariance lines have been drawn for two error pairs on the same constructs. The CFA model indices illustrate the model's overall performance compared to the baseline parameters. Table 2 shows that the CFA model achieved good fits in majority of fit indices. For a fit model, it is expected that the chi-square statistics should not be significant. However, for a model with a sample size like this one (>200) the chi-square statistics is not an important measure of fit. Many researchers seem to completely ignore reporting this measure . Table 2 illustrates the CMIN/DF (χ2/df) ratio for the CFA. This is the ratio of chi-square value and degree of freedom. For a good fit, this ratio needs to be less than 5. The model satisfactorily meets the requirement of a good fit with a ratio of 1.811. The goodness of fit index (GFI) assesses the overall model fit although it is largely dependent on sample size. GFI illustrates a fit between the hypothesized model and the observed covariance matrix. 0.9 generally indicating acceptable model fit. The adjusted goodness of fit index (AGFI) corrects the GFI considering the items present in each latent factor. This model is a good fit considering GFI but not for AGFI. However, present day researchers argue about using these measures . Comparative Fit Index (CFI) illustrates the ratio of ‘difference between χ2 – df of null and proposed model’ to χ2 - df of the null model. To be acceptable the model should have a CFI measure of 0.9. This model satisfactorily meets the requirement as the CFI is 0.959. The incremental fit index (IFI) is affected by sample size. For calculation of IFI, first, the difference between the chi-square of the independence model in which variables are uncorrelated and the chi-square of the target model is calculated. Next, the difference between the chi-square of the target model and the df for the target model is calculated. The ratio of these values represents the IFI. The acceptable IFI score is equal and above 0.9. This model meets the index requirement (0.960). Tucker Lewis index (TLI) is a similar model fit index and also considers 0.9 measures. This model is a fit considering TLI (0.945). Normed Fit Index (NFI) is calculated as the ratio of ‘difference of χ2 between null and proposed model’ to the null model. This model meets the requirement of 0.9 for NFI (0.915). Relative fit index (RFI) compares the chi-square for the hypothesized model to the baseline model. This model does not meet the index requirement of 0.9 . Root Mean Square Error of Approximation (RMSEA) analyses the issues between hypothesized and null model without considering sample size. For a good fit, the model RMSEA has to be equal or below 0.08. This model meets that requirement with a score 0.069. PCLOSE illustrates a 90% confidence interval for RMSEA.PCLOSE provides a false positive rate i.e. p-value for RMSEA. PCLOSE value is expected to be >0.1 for a reliable RMSEA  (Table 2) and (Figure 2). Table 3 shows the loading strength by each item onto the respective latent factors. The loading matrix illustrates that all of the items achieved loading strength >0.4. I could use mobile banking. Figure 3 illustrates the UTAUT path model developed from the analysis of data. 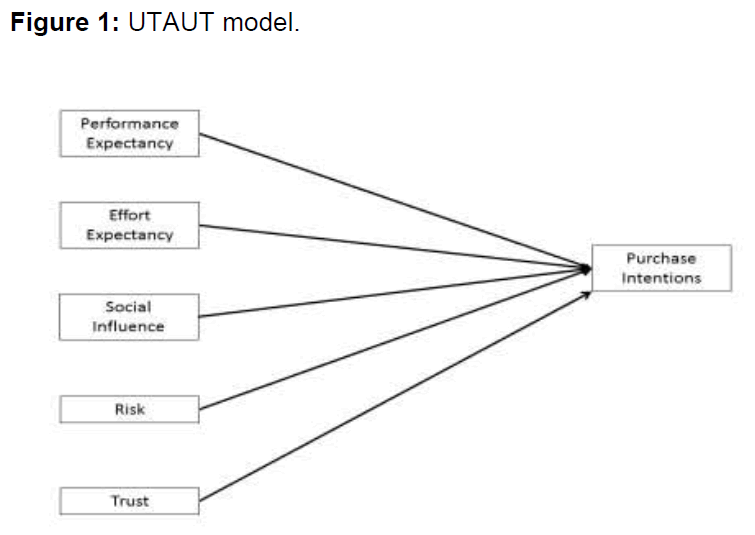 The model illustrates how the five basic factors of a unified theory of acceptance and use of technology (UTAUT) model illustrate participant's intention to use mobile banking. Table 4 below illustrates the model fit indices achieved from the data analysis using AMOS. As explained earlier the achieved values have been compared against the baseline parameters. Table 4 shows that all the fit indices except RFI achieved a good fit. With a value of 0.888, RFI also approaches a marginal fit. Therefore, considering the standard model fit indices, the model is a good fit. Figure 3: Structural equation modeling on application of UTAUT model for mobile banking. Figure 3, displays the influence of five UTAUT factors on participant's behavioural intention to use mobile banking services. The analysis illustrates the application of UTAUT model to mobile banking. Literature supports the application of UTAUT in predicting respondent's behavioural intentions to avail the service of mobile banking. In this study, the model above presents that consumer behaviour in Jordan. The analysis illustrates that respondent's purchase intention of the service is significantly influenced by their performance expectancy (β=0.29, p<0.05), effort expectancy (β=0.21, p<0.05) and perception of risk (β=0.32, p<0.05). Social influence by peers and surrounding (β=0.03, p>0.05) and trust factor (β=-0.05, p>0.05) do not seem to have a significant impact on the purchase intention of the M-banking service at for the scenario in Jordan. Evidence suggest that, for the domain selected for this study, the perception of risk associated with mobile banking is the most influential factor affecting intention to use mobile banking. Sripalawat et al. in their study found that performance expectancy is the most significant factor to consider. Performance expectancy has been found to be the second most significant factor to consider for Jordanian users. Suoranta and Mattila  in their study based in Taiwan and Finland found that influenced by peer groups is the most influential factor affecting behavioural intention. Here, the author did not find any significant influence for social influence. Laforet and Li  conducted similar research in China. Like this one, they too did not find significant influence for social influence. Due to the cultural differences, socio-economic conditions, corporate governance policies in banks, advancement in IT sector and other factors external to the studies, researchers achieved different results. Thus the scope of UTAUT is being further expanded by researchers and it has become an interesting model to understand the behavioural intention to use technology for business and financial dealings. Chian- Son Yu  in his research did not find significant influence for effort expectancy; however, in this study authors found that the amount of effort required i.e. perceived ease of use of the system does play a significant role in consumer's purchase intention. The model illustrates that consumers are likely to adopt the mobile banking services if they are assured of the safety of transaction, they get expected performance and the system is user-friendly i.e. Easy to use. Therefore, to make mobile banking an integral part of daily life and the preferred mean of handling transactions and purchase, banking organizations need to focus on minimizing the risks associated with the system and improve its safety and privacy. The second factor to consider is the promise of fast and flawless performance on the go. The system must be easy to use to engage a greater mass. The use of social media can be advised to promote the merits of mobile banking [36-39]. There are basically 6 hypotheses which have been established before starting this study and this study is conducted under the direction to assess these hypotheses. All the hypotheses have been assessed using the developed questionnaire and data gathered. Table 5 shows the status of hypothesis testing from the analysis of data gathered. Table 5: Hypothesis testing results. The main aim of this study has been to extend the application of UTAUT model to mobile banking scenario in Jordan. The study investigates the application of UTAUT as a theoretical framework for predicting user's intention to use mobile banking and provide suggestions to invest logically in improving in certain areas that are likely to provide a better overall result. Analysis illustrated that user's performance expectancy, effort expectancy and risk perception plays a significant role in predicting his/her intention to use mobile banking services. This led us to retain hypothesis 1, 2 and 4. From the analysis, we could not establish evidence of any significant relation by social influence and trust on intention to use mobile banking services. Therefore, hypothesis 3 and 5 has been rejected. The UTAUT model was a good fitting theoretical framework to explain the purchase intention of mobile banking services and therefore, Hypothesis 6 could not be rejected [40-48]. The study did not consider the possible variability due to respondent's social status, gender and age. This is already explained that the study focuses on people from a specific geographical location i.e. Jordan. Therefore, the conclusion cannot be generalized for people from other countries without reducing the confidence in findings. This limitation has been put on due to the limited timeframe and people's intention to share their demographic information. In addition to this, this has also been a limitation that it is impossible to assess that whether each and every participant was fully focused on the questions because inconsistency in data can lead to poor results. Advancement in technology and its infrastructure is opening up windows of opportunity to support and easy the process of day to day financial transactions and business. Mobile banking is not only empowering it's users to be more active but also enables them to pay/shop as they go. This is portable and with proper support can be a very user-friendly method of transaction-enabling users to participate without breaking a sweat. The possibilities are endless promising a great deal of control and privacy. In spite of the promise, its usage is still very small compared to the entire banking transactions conducted every day. Lack of proper knowledge, perceived fear of security, usability, availability and performance holding people back from adopting mobile banking services. In this study authors tried to explore the factors that influence Jordanian people's intentions to avail the service. Past researchers illustrated that UTAUT model has better predictive capabilities compared to models such as TAM/TAM2 and TPB/DTPB for acceptance of technology authors were inspired to apply UTAUT model to explore the adoption opportunities of mobile banking in Jordan. As the behavioural intentions to adopt technology can be different from culture to culture  and it depends on a region's IT infrastructure, authors were encouraged to explore the scenario for Jordan. The study attained results which have been consistent with the past researchers. Some associations did come out to be different and those are logically discussed and compared with the findings of previous researchers. The study considered the business implications of the results achieved and carefully noted the limitations and risk of generalizations. Barnes SJ (2003) Mobile banking: concept and potential. International Journal of Mobile Communications 1: 273-288. Cruz P, Neto LBF, Munoz-Gallego P, Laukkanen T (2010) Mobile banking rollout in emerging markets: Evidence from Brazil. International Journal of Bank Marketing 28: 342-371. Luarn P, Lin HH (2005) Toward an understanding of the behavioral intention to use mobile banking. Computers I Human Behavior 21: 873-891. Laukkanen T (2007) Internet vs. mobile banking: comparing customer value perceptions. Business Process Management Journal 13: 788-797. Yang AS (2009) Exploring adoption difficulties in mobile banking services. Canadian Journal of Administrative Sciences 26: 136-149. Kleijnen M, De Ruyter K, Wetzels M (2007) An assessment of value creation in mobile service delivery and the moderating role of time consciousness. Journal of Retailing 83: 33-46. Cheah CM, Teo AC, Sim JJ, Oon KH, Tan BI (2011) Factors affecting Malaysian mobile banking adoption: an empirical analysis. International Journal of Network and Mobile Technologies. Zhou T, Lu Y, Wang B (2010) Integrating TTF and UTAUT to explain mobile banking user adoption. Computers in Human Behavior 26: 760-767. Sulaiman A, Jaafar NI, Mohezar S (2007) An overview of mobile banking adoption among the urban community. International Journal of Mobile Communications 5: 157-168. Suoranta M, Mattila M (2004) Mobile banking and consumer behavior: New insights into the diffusion pattern. Journal of Financial Services Marketing 8: 354-366. Venkatesh V, Thong JYL, Xu X (2012) Consumer acceptance and use of information technology: extending the unified theory of acceptance and use of technology. MIS Q 36: 157-178. Zhou T, Lu Y, Wang B (2010) Integrating TTF and UTAUT to explain mobile banking useradoption. Comput Hum Behav 26: 760-767. Foon YS, Fah BCY (2011) Internet banking adoption in Kuala Lumpur: An application of UTAUT model. International Journal of Business and Management 6: 161-167. Sripalawat J, Thongmak M, Ngramyarn A (2011) M-banking in metropolitan Bangkok and a comparison with other countries. The Journal of Computer Information Systems 51: 67-76. Alalwan AA, Dwivedi YK, Rana NP, Lal B, Williams MD (2015) Consumer adoption of Internet banking in Jordan: examining the role of hedonic motivation, habit, self-efficacy and trust. J Financ Serv Mark 20: 145-157. Migdadi YKA (2012) The developing economies’ banks branches operational strategy in the eraof e-banking: the case of Jordan. J Emerg Technol Web Intell 4: 189-197. Alafeef M, Singh D, Ahmad K (2012) The influence of demographic factors and user interface on mobile banking adoption: A review. J Appl Sci 12: 2082-2095. Venkatesh V, Morris MG, Davis GB, Davis FD (2003) User acceptance of information technology: Toward a unified view. MIS Quarterly 27: 425-478. Brown I, Zaheeda C, Douglas D, Stroebel S (2003) Cell phone banking: predictors of adoption in South Africa-an exploratory study. International Journal of Information Management 23: 381-394. Amin H, Hamid MRA, Lada S, Anis Z (2008) The adoption of mobile banking in Malaysia: The case of Bank Islam Malaysia Berhad. International Journal of Business and Society 9: 43-53. Dasgupta S, Paul R, Fuloria S (2011) Factors affecting behavioral intentions towards mobile banking usage: Empirical evidence from India. Romanian Journal of Marketing 3: 6-28. Riquelme H, Rios RE (2010) The moderating effect of gender in the adoption of mobile banking. International Journal of Bank Marketing 28: 328-341. Puschel J, Mazzon JA, Hernandez JMC (2010) Mobile banking: Proposition of an integrated adoption intention framework. International Journal of Bank Marketing 28: 389-409. Pederson P, Ling R (2002) Modifying adoption research for mobile internet service adoption: cross-disciplinary interactions. In Proceedings of the 36th Hawaii International Conference on System Sciences, Big Island, HI. Laforet S, Li X (2005) Consumers’ attitudes towards online and mobile banking in China. International Journal of Bank Marketing 23: 362-380. Kim KK, Prabhakar B (2004) Initial trust and the adoption of B2C e-commerce: the case of internet banking. Database for Advances in Information Systems 35: 50-64. Saunders M, Thornhill A, Lewis P (2009) Research methods for business students. Yates D, Moore D, Starnes D (2008) The practice of statistics (3rd edn.). Freeman, New York. Cooper D, Schindler P (2011) Business research methods. McGraw-Hill/Irwin, New York. Venkatesh V, Zhang X (2010) Unified theory of acceptance and use of technology: U.S. vs. China. Journal of Global Information Technology Management 13: 5-27. Sekaran U (2003) Research methods for business (4th edn.). John Wiley and Sons, Hoboken. Kenny DA, Kaniskan B, McCoach DB (2014) The performance of RMSEA in models with small degrees of freedom. Sociological Methods and Research. Sharma S, Mukherjee S, Kumar A, Dillon WR (2005) A simulation study to investigate the use of cutoff values for assessing model fit in covariance structure models. Journal of Business Research 58: 935-943. Bollen KA, Long JS (1993) Testing structural equation models. Newbury Park, Sage, CA. Chian-Son Y (2012) Factors affecting individuals to adopt Mobile Banking: Empirical evidence from the Utaut Model. Taiwan Journal of Electronic Commerce Research. Laukkanen T, Pasanen M (2008) Mobile banking innovators and early adopters: How they differ from other online users? Journal of Financial Services Marketing 13: 86-94. Laukkanen T, Sinkkonen S, Kivijarvi M, Laukkanen P (2007) Innovation resistance among mature consumers. International Journal of Marketing 24: 419-427. Park JK, Yang SJ, Lehto X (2007) Adoption of mobile technologies for Chinese consumers. Journal of Electronic Commerce Research 8: 196-206. Yang K (2010) Determinants of US consumer mobile shopping services adoption: Implications for designing mobile shopping services. Journal of Consumer Marketing 27: 262-270. Yang KCC (2004) A comparison of attitudes towards Internet advertising among lifestyle segments in Taiwan. Journal of Marketing Communications 10: 195-212. (2013) The Jordan Times: Mobile phone penetration projected to reach 200%. Venkatesh A, Shih E, Stolzoff N (2000) A longitudinal analysis of computing in the home. In: Sloane A, Van Rijn F (eds.) Home Informatics and Telematics, Springer, US, pp: 205-215. Venkatesh V, Morris MG (2000) Why don’t men ever stop to ask for directions? Gender, socialinfluence, and their role in technology acceptance and usage behaviour. MIS Q 24: 115-140. Zhou T (2012) Understanding users’ initial trust in Mobile banking: An elaboration likelihood perspective. Comput Hum Behav 28: 1518-1525. Kenny DA, McCoach DB (2003) Effect of the number of variables on measures of fit in structural equation. Hu L, Bentler PM (1999) Cutoff criteria for fit indexes in covariance structure analysis: conventional criteria versus new alternatives. Structural Equation Modeling: A Multidisciplinary Journal 6: 1-55. Kuisma T, Laukkanen T, Hiltunen M (2007) Mapping the reasons for resistance to Internet banking: a means-end approach. International Journal of Information Management 27: 75-85. Ching-Mun C, Aik-Chuan T, Keng-Boon O, Jessica CJW (2013) Extending the Utaut model in m-banking adoption. International Conference on Technology Innovation and Industrial Management, Phuket, Thailand.